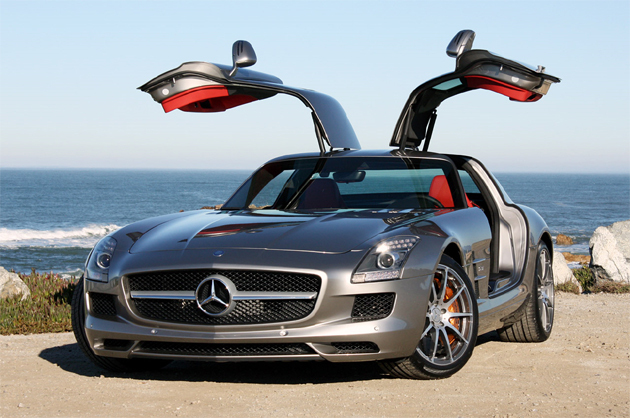 "The new SLS AMG Mercedes-Benz is a captivating supercar that will capture the hearts of all car enthusiasts. The SLS AMG represents pure sensation for the Mercedes-Benz brand and is set to become one of the most desirable sports cars of our time," says Dr. Dieter Zetsche, Chairman of Daimler AG and head of Mercedes-Benz Cars. "Our customers will enjoy an SLS AMG that embraces more than 40 years' motorsport experience from our sports car specialists Mercedes-AMG – as well as a fascinating design that only the Mercedes-Benz brand can deliver," says Volker Mornhinweg, Chairman of the Management Board at Mercedes-AMG GmbH. The new Mercedes-Benz SLS AMG features a distinctively pure design, superior dynamics and levels of safety and everyday practicality that are the hallmarks of Mercedes-Benz. The ideal weight distribution (47:53 percent between front and rear axles) and low centre of gravity underline the uncompromising nature of its sports car concept. During the development phase of the new gullwing model, AMG developers benefited from the valuable know-how of specialists at the Mercedes Technology Centre (MTC) in Sindelfingen. The aim of such collaborative development was to make the SLS AMG a perfect synthesis of the strengths of Mercedes-Benz and AMG. The advanced AMG 6.3 litre V8 engine produces a peak output of 571 hp (420 kW) at 6800 rpm, making the SLS AMG one of the most powerful sports cars in its segment. Accelerating from 0-100K mph takes just 3.8 seconds.Top speed is 317 Kmph. Key measures implemented to enhance performance include a complete redevelopment of the intake system, a redesigned valve assembly and camshafts, the use of a flow-optimised tubular steel exhaust manifold, and de-restriction of the exhaust system. The 8-cylinder engine reacts with agility to accelerator pedal movements and demonstrates greater responsiveness across the entire engine speed range. The conversion to dry sump lubrication allows a significantly lower engine mounting position, with the resulting lower centre of gravity enabling high lateral acceleration and scintillating vehicle dynamics. The interior of the new gullwing model delivers genuine motorsport functionality, legendary Mercedes safety standards and outstanding ergonomic qualities. Unique aviation-inspired styling cues include air vents reminiscent of jet engines and a unique wing-shaped dashboard. A range of fine materials, including nappa leather and real metal trim (real carbon trim available as an option), emphasise the finer quality of the SLS interior and reveals a meticulous attention to detail. Electrically adjustable sports seats with integrated head restraints provide optimum lateral support and excellent comfort for long journeys. Other highlights include the AMG Performance leather steering wheel in 3-spoke design with flat lower section, 365 mm rim, gearshift paddles, and real metal trim. Standard SLS features such as hand-sewn designo leather with contrasting top-stitching on the instrument panel, sports seats, door interior trim and armrests typify the vehicle’s authentic hand-finished character. The Media Interface and DVD changer also feature as standard. The interior of the SLS AMG delivers authentic motorsport functionality, legendary Mercedes safety standards and outstanding ergonomic qualities. A range of fine materials, including nappa leather and real metal trim (real carbon trim available as an option), emphasise the hand-finished character of the SLS interior and reveal a meticulous attention to detail. Electrically adjustable sports seats with integrated head restraints provide optimum lateral support and excellent comfort for long journeys. The AMG Performance leather steering wheel in 3-spoke design with flat lower section and 365 mm rim, gearshift paddles, and real metal highlights emphasise the vehicle’s authentic hand-finished character – as does the attractive instrument cluster. Standard SLS features include hand-stitched designo leather with contrasting top-stitching on the instrument panel, sports seats, door interior trim and armrests. The Media Interface and DVD changer also feature as standard. On-board comfort can be enhanced with an attractive range of optional extras, including the new Bang & Olufsen sound system, designo Exclusive leather and the interior carbon package. The AMG 6.3 litre V8 engine with 32 valve transfers its impressive power to the rear axle via a particularly light carbon drive shaft – similar to those used in DTM C-Class touring race cars. The transmission system is located at the rear axle (transaxle principle) and this, combined with the front-mid engine position, ensures an ideal front/rear weight distribution of 47 to 53 percent. The transmission has a fixed link to the engine block via a torque tube, which contains a rotating carbon driveshaft. The advantages of this sophisticated solution include a rigid connection between engine and transmission and an optimum support structure for the forces and torque levels generated. A new seven-speed AMG double-clutch transmission is responsible for power transmission, characterised by its rapid gear changes without an interruption in tractive power. The SLS AMG features an ingenious suspension set-up that has been tried and tested in motor racing, right through to Formula 1. All four wheels are positioned on a double-wishbone with track rod, providing the driver with exceptional feel and response. This is complemented by the precise, assured handling of the rack-and-pinion steering system with a constant mechanical ratio of 13.1:1. Power assistance is speed-sensitive, ensuring optimum agility at lower speeds and maximum stability in straight-line, high-speed situations. By mounting the steering gear on the subframe in front of the engine, the engine can be set back low in the car, helping to give the SLS AMG its reassuringly low centre of gravity. The result is a supercar that combines supreme racetrack performance with the long journey comfort that is the hallmark of Mercedes-Benz. The AMG high-performance brake system with all-round composite technology ensures extremely short braking distances even under enormous load intensities. Further braking performance and reduced unsprung masses are guaranteed by the new optional ceramic composite brake system with larger brake discs. As you’d expect, both systems offer outstanding heat dissipation and fade resistance. The price of SLS AMG is Rs 1.37 Cror and £168,395.00 .